Are you ready for the best movie of the summer, not to mention one the best films of the year so far? Well then, here...we…go. Christopher Nolan’s The Dark Knight is a cinematic revelation. It transcends anything we’ve previously seen in the comic book adaptation genre, including its refreshing predecessor, Batman Begins. The action is real (Nolan uses very little special effects), the editing is tight, the camera work is steadily smooth and the music is effective. I’ll only briefly touch on plot. Batman (Christian Bale) is growing a little wiry of protecting his Gotham city. He wants a new hero, one that doesn’t wear a mask. He finds it in hotshot District Attorney Harvey Dent (Aaron Eckhart), who is soon dubbed as Gotham’s “White Knight”. Batman is ready to throw up his cape in order to spend his life with Rachel (Maggie Gyllenhall, replacing Katie Holmes). 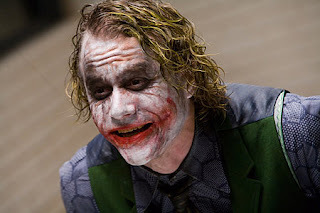 But fighting crime through the justice system only gets you so far when you have a fanatical, suicidal madman, known as the Joker (Heath Ledger) terrorizing the city. That’s all you’ll get, and frankly, that’s all you need. Instead, let’s focus on the performances, which make the movie, a rare feat in the summer blockbuster season. 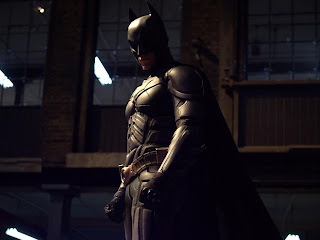 As Bale proved in Batman Begins, he is easily the best man to have filled out the bat suit. His commanding presence and booming voice as the Caped Crusader are spot on. And his suave, laid-back persona as Bruce Wayne brings subtle reminiscent of Bale’s star-making role as Patrick Bateman in American Psycho, (which is a good thing). Watch how Bale, as Bruce Wayne, feels out Dent in a dinner scene. With one tight-zoom shot and a subtle smirk, he knows he can trust him. Gary Oldman (one of cinema’s great chameleons) delivers some of the best work of his career, reprising his role as the honest Commissioner Jim Gordon. Michael Caine and Morgan Freeman hit all the right notes in their respective roles. As does Gyllenhall, who throws out Holmes’ sweet sensitivity and replaces it with feminist ferocity. Eckhart is in great form as Dent, who admires the Batman and has his own plans to bring justice to the corrupt city. But we all know whose show it is, and we all know why you’re here. Heath Ledger, as the Joker, is better than everything you’ve heard. Every single aspect of his performance is completely flawless. From his nasal, screechy voice, to his slow-moving walk (as if he can’t bend his knees), to his pancake-smeared make-up, this is as fine an acting accomplishment as I can recall. It’s damn near impossible to find that handsome actor hidden behind those dark eyes. Ledger is believable with every nuance of his behavior. Watch him carefully, you’ll be utterly dazzled. Watch how (in one the film’s most shocking scenes) he makes a pencil disappear. Watch how he casually strolls into a room with no fear. Watch as he circles Gyllenhall, smacking his lips together, almost ready to devour her. Listen to his subtle, creaky laugh before it bursts into a gut-wrenching, manic howl. Listen how he delivers a classic movie line: it’s funny to the audience, but he is deadly serious. Listen to how he tells stories from his past, almost happy that he turned out how he did. I could dissect every single moment that Ledger is on screen in The Dark Knight as a brilliant one. There is no one scene of his that is better than the rest. Of course this is made all the more tragic due to Ledger’s sudden death in January of this year. If he were still alive, we’d be talking about how this performance is going to put him to the top of the A-List. It would be a career-making performance, but instead, it is now a career-defining one. Only a handful of actors have been nominated for an Oscar after they’ve died (Peter Finch being the only winner for Network). If there was ever a role to earn a posthumous Academy Award, then this is it. Ledger anchors a breathtaking film by showing us something that we’ve never seen him do. And sadly, that we won’t see again. Yeah, I'd agree with that too. And also with all that's written in your review. It is a classic movie even though I did feel like I needed a shower when I left the theater... the Joker creeped me out so much, I felt dirty. See this film in IMax if you can. Not to be overly sentimental because I know you don't like that sort of thing. Or maybe you do, but a lot of people don't. But what you said about Heath Ledger really put a tear in my eye. What do you think about the other performances? Ahemmmm Gylenhaal? & this movie had a lot of politcal undertones & so many messages that it is hard to believe that it is just a superhero movie. What do you think about all that Mr. Withrow? I'm a pretty big comics geek, but almost no comics based films work for me. It's a combination of not being too interested in superhero comics and the standard problem of knowing the source material and comparing the film with it. Other comic-based films that worked for me - Ghost World, Hellboy, Road To Perdition, and Sin City. A+, wow. I don't think I'd speak quite as highly of this now, but I do still love it. Completely agree: comic book movies are not for me, but Nolan's trilogy is the exception. Love your other picks, but I've never seen Hellboy. I adore Guillermo del Toro, but I thought that was going to be too comic booky. No? Ghost World... whatta classic. The two Hellboy movies are comic booky, but they're more fantasy/supernatural than superhero. If nothing else, you get in del Toro's mind for the visuals. Just that's worth an afternoon. Hell yeah it is. Gonna check 'em out soon. Thanks!